Spring came, Spring left, and now it seems to be returning again. I did say that it was a fickle season and this past couple of weeks proved my point. A week ago Monday it was 70 degrees, this Monday we had a snow-fall of about 5 inches, wet, heavy stuff. Today there is hardly any trace left of that 5 inches. "Hope for the best. Expect the worst. Life is a play. We're unrehearsed." ~ Mel Brooks That about sums up Spring around here. 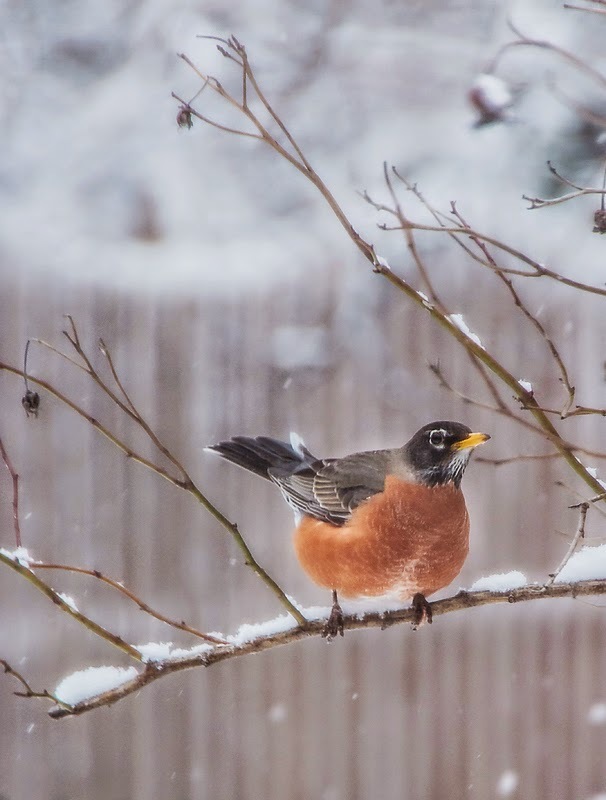 I did manage to find a robin or two during the snowstorm, sitting on the rose bushes in the backyard, patiently waiting for the snow to stop. I get real antsy about this time of year. The holidays are long gone, the winter has gone on too long, my getaway to Arizona is over, too early to even think about planting flowers, it's that ho-hum time of the year for me. I start getting real lazy....sitting around reading, binge watching TV shows, playing solitaire on my I-Phone, ya know all really important meaningful ways to spend the day. I volunteered to take pictures of the animals at our Humane Society, thinking I would go a couple of times a week. But after further discussion, I think they want someone that can come practically every day. I don't know if I want to be that committed to a volunteer undertaking. They did say they needed photographers for their events, which is a consideration. I was so excited about the possibility of being around animals and photographing them, but it's just a might much for me to commit oneself to. I know my limits. We have been studying Joanna Weaver's "Having a Mary Spirit" in Bible Study. This last week we focused on forgiving others. Sometimes we have been hurt and the person responsible isn't even aware of the hurt. Many times we carry this burden of hurt and don't want to forgive. I found this quote today and thought it was so appropriate for letting go.... "Holding on to anger, resentment and hurt only gives you tense muscles, a headache and a sore jaw from clenching your teeth. Forgiveness gives you back the laughter and the lightness in your life." ~ Joan Lunden Isn't that just perfect. 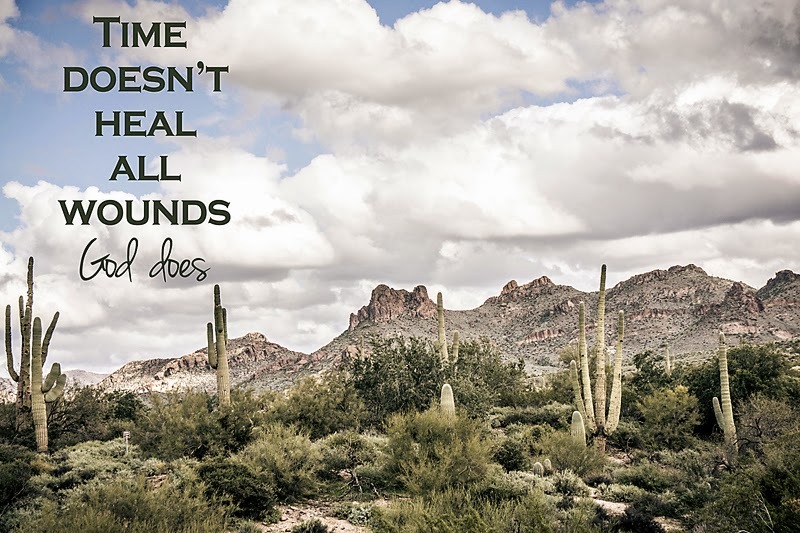 And I also found this on Pinterest and decided to add it to an Arizona image of mine. Yes, we can count on God and his love for healing old wounds and help us to forgive. Who wants to carry around old hurts, not me. 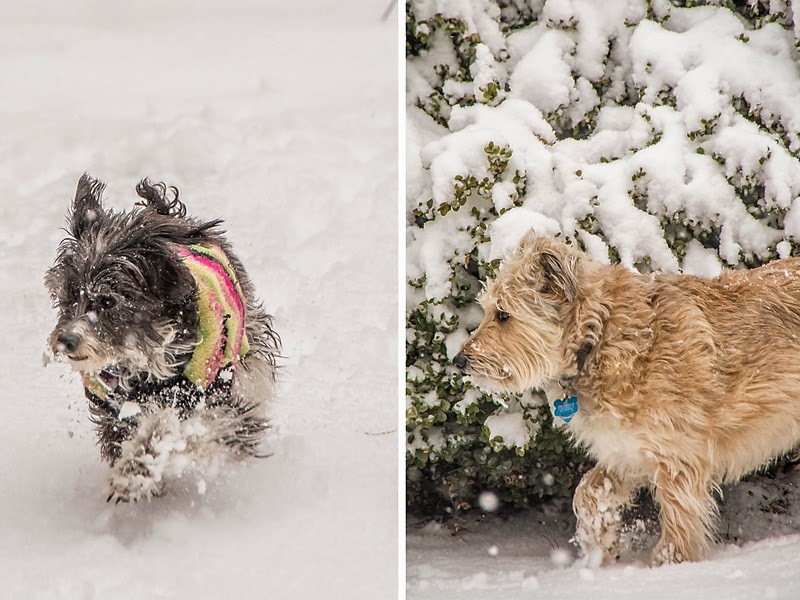 Love the shots of your two dogs collecting snowballs in their fur! the up/down weather changes are tough. then it seems others get hit hard by 'summer' storms way too early. your pups are cute. so are the robins. thanks for the fences, deanna! Winters last hurrah...spring is late everywhere, even Mexico. This is the latest ever recorded that the Monarchs have left their over winter site in the mountains. Love and miss the robins!! I hate the ups and downs! 70 still is a pipe dream for us! A lovely post with some wisdom we all need to be reminded of every now and again. I love your new banner! And isn't Cinder adorable in her little pink coat? Well, we may want the snow to be gone, but your dogs sure look as though they're enjoying it! The robins are so pretty, too! March is my least favorite month of the year for all the reasons you describe. It's kind of a nothing sort of month in the northern half of the country. Good luck with your new photography assignment! You had better look out on that volunteer stuff at the shelter.... you will be posting photos of your third dog the first thing you know. Hoping that your spring is finally here.... no more snow! The dogs look adorable out there in the snow. 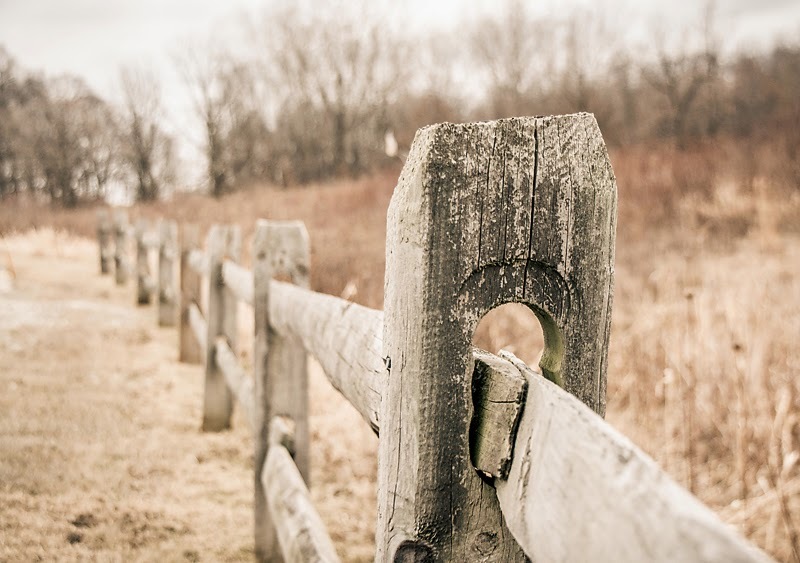 - I really liked your fence shot (such a neat angle) and I'm glad you are getting spring weather again. That Robin is beautiful and I loved your last shot/quote too. That weather of yours is kinda nutty...Mother Nature is sure fickle. Hopefully you're done with snow and nicer weather is knocking at your door. Beautiful pics....like your new header too. Hope you have seen the last of the snow. 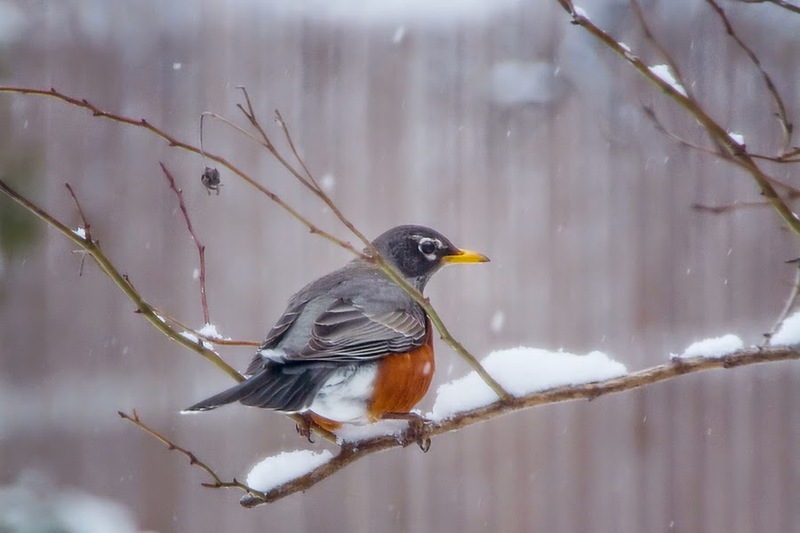 Love the pups shots and the Robins shots are great with the snow. Love your furry snowballs and the rustic fence! Love your head photos . . . They brought some springy pink to my step! It certainly is a fickle time of the year . . . I heard about your five or six inches of white snow . . . They are predicting we might see some snow here this weekend. I saw a few Robins during my morning walk yesterday, my first. They seemed to be confused about . . . as they walked down the road with me! The ground is much to frozen to find worms! I like the Joan Lunden quote . . . so very true . . . about laughter and lightness in a forgiving heart . . . I can't believe you got snow again. Mother nature is really messing around with us this year. So many great shots my friend. Oh I forgot to tell you that I LOVE your new header..